You’re all about adding to your wealth of knowledge in the ninth house, and Pluto gives you the desire to go out and explore. It reinforces your stamina and gives you plenty of energy to go on another trip. And when you get back you’re ready to discuss your adventures. Pluto symbolizes secrets, renewal, control, power, coercion, fear of loss. 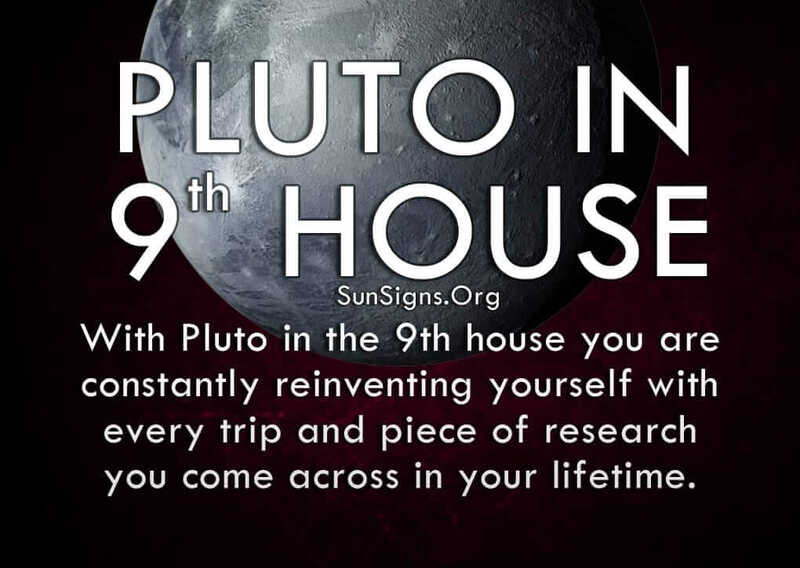 With Pluto in ninth house you are constantly reinventing yourself with every travel trip and piece of research you come across in your lifetime. This can make it difficult for people to keep up with all the excitement going on in your daily routine. You hate standing still and your mind is always going a mile a minute, making you a very rushed and busy individual. Plus you always have something new to tell people, and may not have the patience for other people’s problems or conversations. This is because Sagittarius is your ruling zodiac sign. Pluto in ninth house astrology asks you to make sure your spiritual growth is not at the expense of anyone else’s, for you tend to get lost in your own personal journey. Don’t forget there are friends and loved ones who may depend on you as much as you depend on them. You don’t have to forfeit your happiness just because someone else is equally happy and excited about something in their life. Use your talent for learning and your desire to spread that knowledge by becoming a teacher or lecturer, or join some kind of profession where you get to put that information to good use. Your optimism and enthusiasm is infectious, and it inspires others to improve themselves as well. The only thing you really fear is new ideas that rival your own, but that just means you have a new topic to research. It’s okay to change your mind if you learn something that expands your understanding of an idea or theory. That’s how humanity and society grows as a whole, and you could be on the forefront of that change leading the charge. Another thing that can get in the way of relationships of people with Pluto in 9th house is your arrogance. Because you are well-educated you tend to have very strong beliefs about things. And when your beliefs are called into question you get defensive and turn a regular discussion into an argument. You think of yourself as deep and intelligent and become offended when someone challenges your ideas. Pluto in 9th house astrology suggests you don’t dismiss people automatically just because they hold different views from you. Listen to what they have to say and defend your position. Sometimes you will be right, sometimes you will be wrong, and then other times there is no winning side. Some things are subjective and can be understood from both sides of the issue. This kind of discourse will help add to your wealth of knowledge, so use it as a learning tool rather than an attack on your belief system. You don’t always know as much as you think on every subject. Just be careful not to aggressively convert people to your beliefs, or else you will lose the majority of your audience. That kind of teaching can be seen more as bullying. Use your creative nature to calmly and slowly bring people in to listen to your ideas, and encourage an open discussion about the pros and cons. It’s this kind of civil discourse that will move the world forward.